From bangs to braids to messy hair, the women’s hair has been a great tool to enhance the appearance. Women are in search of hairstyles that could make them attractive in a unique way. To be honest, hairstylists around the world have countless styles for different types of hairs. The question is; what hairstyle suit what person? Well, the answer depends on the hair type, hair color, and interests of the person. This article sheds light on the top five hairstyles women love to make. Please continue reading to learn more about it. Marilyn Monroe was of the view that; “give a girl the right shoes and she can conquer the world.” Another school of thought suggest; “give a girl the right hairstyle and she will be unstoppable.” It is true that hair and shoes are important for a girl. From Marilyn Monroe’s world-famous platinum blonde hair to androgynous flat top of Grace Jones, time and time again we have witnessed the transformative power of a truly great women’s haircut. Let’s see what hairstyles are going to be nice in 2018. Whether you have black hair or you are blond, the following 5 hairstyles may suit you. Did you know bob and bangs is one of the favourites of Vampire Diaries start Nina Dobrev? This chin-grazing style has long been used by women to stun others. 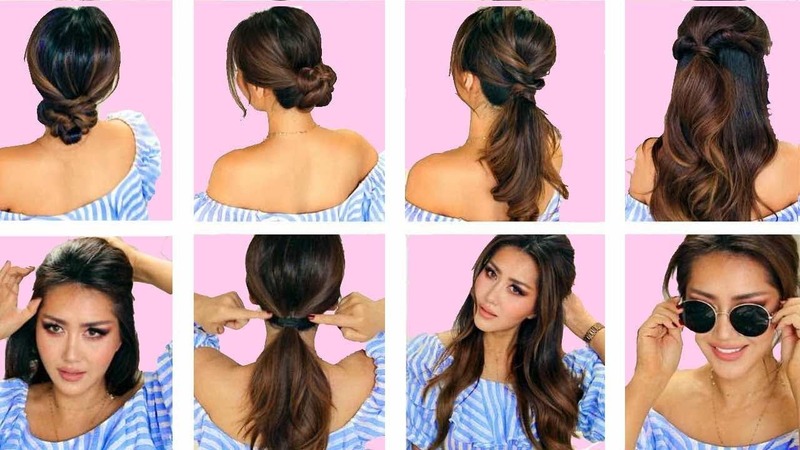 You could be the next woman to rock her world by trying this stunning hairstyle. Are you up for it? So spare some time or simply go to your hairstylist and take the challenge. Not sure if your hair can afford this cut? No worries, ask your stylist about it and try other options if it is not good for you. Though this hairstyle suit a particular hair length and body size, you can always challenge this trend. If you are feeling lucky, you should try this hairstyle on special occasions. This haircut is for you if you want to lose a ton of length but don’t mind styling your hair every day, this hairstyle has many variations and you can adjust it as per your needs. If you are still confused about it, do not hesitate to visit your stylist to learn more. You can always get a free consultation. Cannot you do this for your hair? Wispy bangs and a shag cut has been around for quite some time. It has been one of the most favorites of Hollywood celebrities. If you want to grow out a shag haircut, wispy bangs and shag cut is for you. Grow your hair as per the required length and then visit your hairstylist in a good day. Ask your professional to make wispy bangs and a shag cut if possible. This haircut is one of the favorites of Jaime King. You do not have to follow exactly the same style, you can customize it as per your needs. Do you know what the favorite hairstyle of Naomi Watts is? It is the choppy bob which is the best 2018 celebrity style so far. The hair incorporates subtle layers and it can fall below or above the chin. Trying this cut would be the best thing you could do to look good this year. Please note this cut looks stunning with waves; it would be good to use a curling device. If you are not into hot devices, you can skip using curling devices. You may not have ever thought about trying curtain bangs but we swear you should go for it. The reasons being it is so far one of the hottest cuts for the women with different colors. No matter what hair color you have, you might be a good candidate for this updo. If you’re already growing out your fringe, you probably already have them. If you are interested, visit your pro and he or she will tell you the details. You have just read about the top 5 hairstyles celebrities love the most. So feel free to give yourself a celebrity look this winter. Famous hair care brand Schwarzkopf writes on their website; “most women have experienced that sinking feeling in their stomach when they discover that the beautiful long layered haircut for women they envisioned somehow ended up as a choppy bob with a fringe.” So you do not want to be like those disappointed girls out there. You are going to get what suits you. We wish you all the best for your next haircut. Julia Swift is a Copywriter and blog writer. She has extensive experience in ghost blogging. Due to her intensive interest in the cosmetology, she has decided to write for Euromed under the supervision of expert surgeons for all plastic and cosmetic surgeries. How To Find Your Perfect Pair Of Overall?